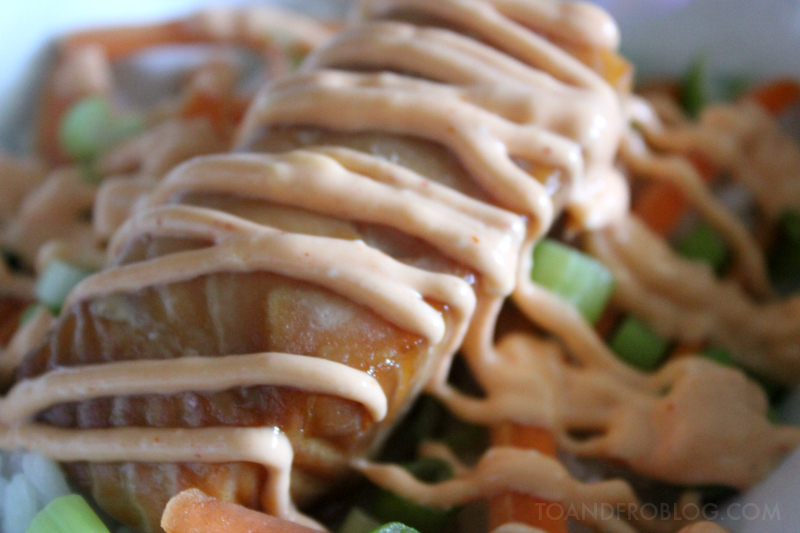 A few weeks ago, I confessed my love for spicy mayo. Seriously, I could eat that stuff by the spoonful. 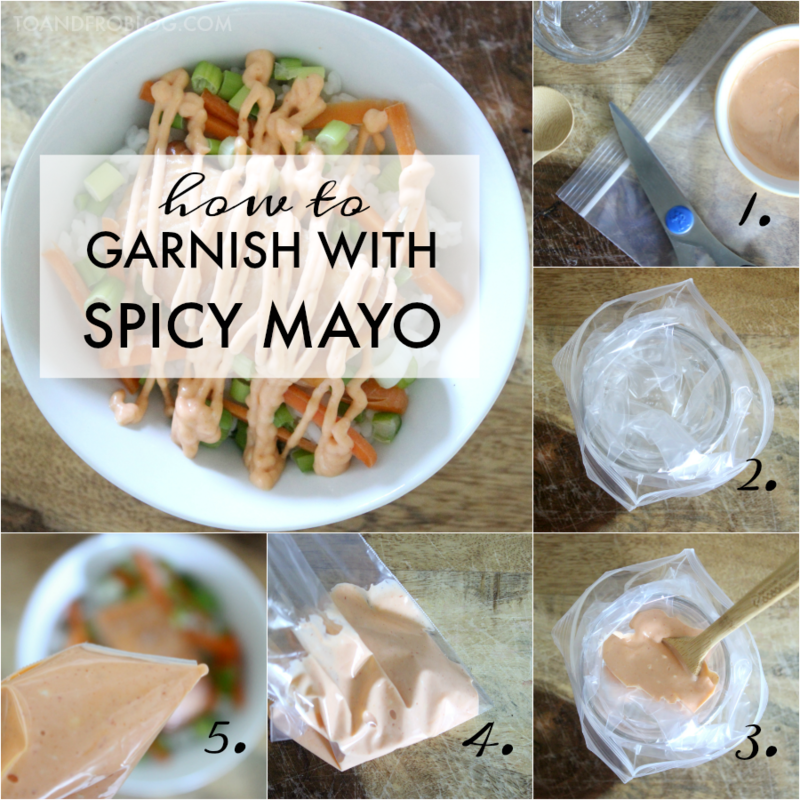 Want to know another ingredient that spicy mayo is yummy on? Salmon. 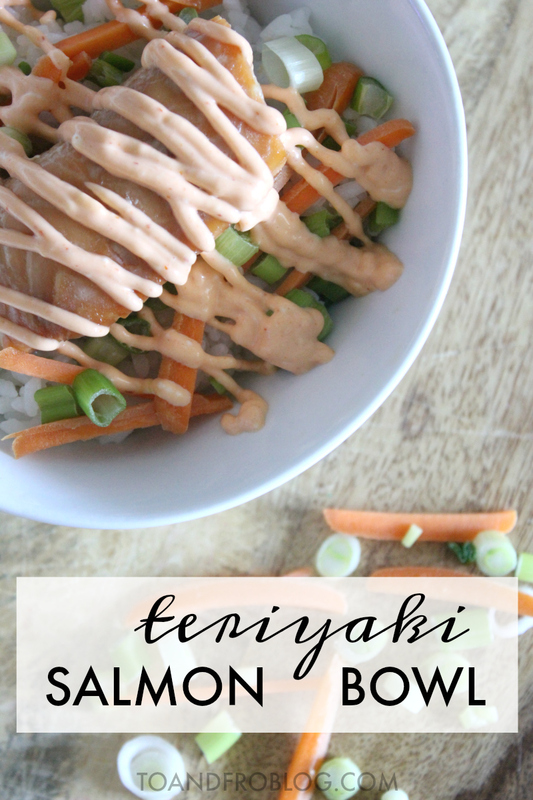 Specifically, this Teriyaki Salmon Bowl recipe. I can't say it enough that when I look for dinner recipes, they need to be three things: 1) healthy 2) easy and 3) inexpensive. When it comes to healthy eating, salmon is on the list. Salmon is a good source of protein and omega-3 fatty acids, which are good for your heart. In fact, The American Heart Association reports that consuming 8 ounces of fish per week (approximately 2 meals) can lower your risk of heart disease. It is also high in vitamin D, which helps maintain healthy bones and teeth. So, why wouldn't you want to eat it? When I say easy and inexpensive, I truly mean it. Having a 4 month old is a full time job and not one that's kind on the wallet. This meal only takes about 20 minutes start to finish, and all ingredients considered, each portion of this recipe costs around $3.00. My kind of meal. So dinner needs to be one, healthy. Check. Two, easy and three, inexpensive. Check. Check. Marinade salmon pieces in teriyaki sauce. This can either be done at time of purchase by adding two fresh fillets and 1/4 cup teriyaki sauce to a medium-sized freezer bag and freezing in sealed bag (for up to 6 month) or by marinading in sauce for at least 2 hours in the fridge. Cook rice as per package. While rice is simmering, cook the salmon for 15 minutes, or until done. 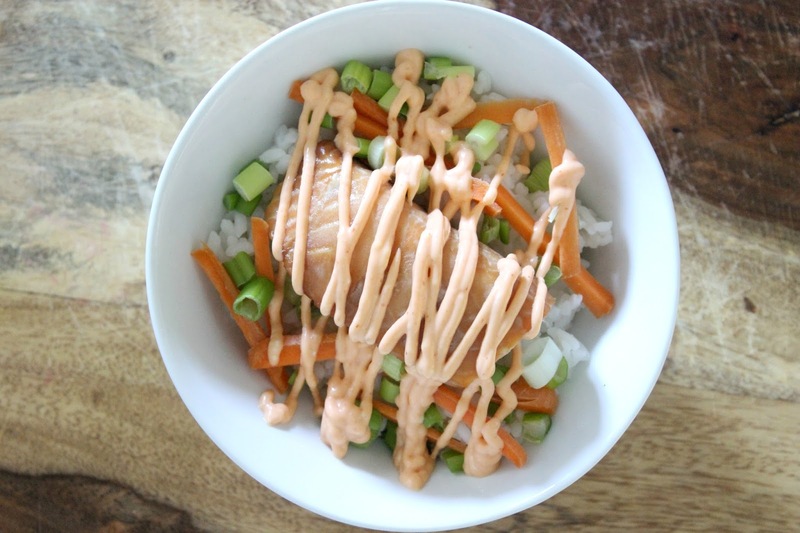 In small bowl, mix mayonnaise and sriracha to create spicy mayo. Add more sriracha for desired spiciness. In an individual serving bowl, layer ingredients: rice, salmon, carrots and onions. Drizzle with spicy mayo (see below for instruction on how to garnish). Place small sandwich bag inside small drinking glass and fold top of bag over the edges of the glass. Using the spoon, scoop the spicy mayo into the bag. Remove the bag from the glass and carefully squeeze the spicy mayo into one bottom corner of the bag. Holding the bag at the top of the spicy mayo, carefully make a small cut in the corner of the bag. Make sure not to squeeze the mayo too tight as it will come squirting out of the bag. Applying a bit of pressure, squeeze the bag until the mayo starts coming out of the corner of the bag. Garnish the salmon (or other food item) as you see fit - straight thin lines, squiggly lines, thick lines, etc. Remember when purchasing seafood, sustainable is best. When it comes to Atlantic salmon, open-net pen farmed is why you're looking for. And if you prefer wild caught, make it gill net caught Chinook from British Columbia and Alaska. If you love seafood, check out this recipe for Scallop and Chorizo Bites or Mussels with Garlic Wine Sauce. The perfect appetizer recipe for your next dinner party. Do you like salmon? What is your favourite seafood recipe? Do you make sustainable seafood choices?